Also this weekend I want to watch ‘The Help’ directed by Tate Taylor to see his views and opinions on the book. It would be interesting to see his interpretation of the book. 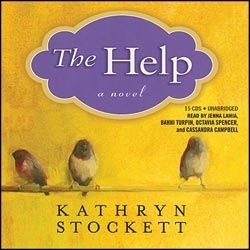 When Eugenia “Skeeter” Phelan returns to her hometown of Jackson, Mississippi fresh from college with a diploma, her mother dismisses it as ”a pretty piece of paper.” And so the novel THE HELP truly begins, for its Skeeter’s story that drives the pages. It’s the age old story of a child now grown, still hoping to appease an unyielding parent. In this case Charlotte Phelan, who in Skeeter’s eyes is pretty, petite, in short everything a Southern belle should be while Skeeter is not. That sets off Skeeter and Hilly’s battle of wills throughout the novel. Not only does Skeeter have to endure her mother’s constant criticisms, but also Hilly’s attempts to run her life. Hilly fires the first warning shot, when she threatens to remove Skeeter as the editor of their Junior League’s newsletter for her untimely joke. For Hilly is hell bent on having her Home Help Sanitation Initiative bill placed into law. To which Skeeter covertly attempts to do just that. She enlists the help of Aibileen to gather up more maids so that she can write a manuscript about their experiences as the Help. Aibileen brings along a friend, the sassy Minny Jackson. Minny has lost a number of jobs because of her sharp tongue, yet with a bit of cunning from Aibileen she lands a job with Miss Celia Foote, a woman who’s an outcast in Hilly’s society circle because she ‘s white trash. Minny and Celia begin a wacky relationship, partly because Celia doesn’t want her husband to know she’s enlisted a maid to help her around the house. As Skeeter’s manuscript on the domestics takes shape, she also finds progress in her love life once Hilly sets her up on a blind date with a state senator’s son. Stuart Whitworth appears to be the answer to both Skeeter and her demanding mother’s prayers. Because by now Charlotte Phelan has been diagnosed with cancer. Skeeter retreats to a time when she was most comfortable, under the care of the loving maid Constantine. So while she peppers Aibileen with questions over Constantine’s rather abrupt departure, Aibileen silently mourns her son’s untimely death. To compensate for her loss, Aibileen develops a strong, loving bond with Miss Leefolt’s daughter Mae Mobley, and her attempts to teach the child how to potty underscore the absurdity of having an outhouse strictly for the Help. In one scene, Mae Mobley refuses to use the toilet, insisting that Aibileen go first. There are several relationships woven throughout the novel. Skeeter and her mother, Skeeter and Hilly, Skeeter and the black maids, Skeeter and Stuart Whitworth. Though she dare not tell Stuart what she’s working on, he appears supportive of her quest to become a writer. Stuart even tells her she’s pretty, something Skeeter has waited all her life to hear. The other relationships include Minny and Miss Celia, Minny and her abusive husband Leroy, and Minny’s friendship with Aibileen. Aibileen in turn develops a growing admiration for Skeeter, a close friendship with Minny, and motherly affection for the love starved daughter of frazzled housewife Elizabeth Leefolt, two year old Mae Mobley. When Skeeter misplaces a satchel filled with research information crucial to her novel, Hilly finds it and demands to know what she’s up to. Because she has to grovel in front of Aibileen, Skeeter gets a taste of what the black help go through. Skeeter lies and pretends her literature is nothing of importance and turns the conversation back to Hilly’s stress over her husband’s political ambitions. But with each lie and hidden meetings with her African American confidants, Skeeter is drawn more and more into seeing how unfair the system of segregation is. As the novel ends, Skeeter learns the part her mother played in Constantine’s decision to leave their employ. And once her book, aptly titled Help is published, its thinly veiled descriptions of actual residents causes a ripple effect, enveloping everyone who reads it. Minny’s husband is fired from his job because of her participation in crafting the book. She finally decides to leave him after he takes his anger out her one too many times. Skeeter and Stuart’s engagement is called off the very night he finally gives her a ring, after she reveals the project was her doing. And Hilly threatens to not only sue Skeeter, but to enact revenge on all the maids whose stories are included in the book. In order to dull her bluster, Aibileen counters with the special pie Minny fooled Hilly with. Its seems Minny, a woman well revered as the best cook by far of all the local help was able to prepare a pie which included her own feces in the mix. And unfortunately, Hilly ate two slices. While Skeeter’s book becomes a best seller, enabling her to finally break free of a still ailing mother and the strict social norms of her town, Aibileen is let go from Elizabeth Leefolt’s household at Hilly’s insistence. Though her heart is heavy at leaving Mae Mobley, Aibileen is comforted by a new position as the unknown cleaning advice columnist, a position that Skeeter relinquished for a job in New York City. Aibileen, along with all the other maids who contributed to the novel have royalty payments to look forward to, though the amount is not enough to live on. Still, the novel ends on an oddly hopeful note, as Aibileen leaves with her head held high, convinced that she’s not too old to start over.